Once again Marilyn Vine in Fluoridation Page is bringing you information on scientific, peer reviewed studies relating to the harm that is caused both in our bodies and our environment. Local health authorities calculated back in 2001 that 4918 youngsters suffered serious bone malformations after drinking the water distributed by state company SNE between 1985 and 2000. “Cryolite dust (an aluminium-fluoride compound) has been used as a pesticide for centuries and when one looks for the method by which it kills bugs, one quickly discovers the mechanism involves the upsetting of trace metal metabolism within cells. When fluoride compounds are used as insecticides, higher concentrations are applied, but when these same poisons enter the human food chain these same deleterious effects occur, only more slowly. Personally I think the graphic below sums up precisely how I feel and I know a great many other Australians and probably people right around the world also feel. August 2016: Journalist Cameron Bennett moderated the debate, which aired on Wednesday as part of the Thinking Green series on Sky Channel’s FACE-TV. As Paul points out at the beginning of the debate, it has taken 12+ years of challenging NZ's fluoride proponents to a public debate to find someone willing to defend the practice. So this is a rare event that we need to get as many people as possible to watch. Please share this video on your social media pages, and with friends, family, and decision-makers via email. Prof Paul Connett in Christchurch New Zealand 6 August 2016. Paul explained the mistake and cover-up made by Gluckman and Skegg in detail during his recent presentation in Christchurch, which can be viewed here. Paul also wrote about the “junk science” review in a recent bulletin. Prof. Berridge was also unfamiliar with the critique of the Broadbent IQ study on which he heavily relied upon to combat concerns regarding fluoride and IQ (see FAN's critique of the study). The journal in which the Broadbent study was published--the Journal of the American Public Health Association--later published a letter by Osmunson, Limeback, and Neurath, which repeated some of this criticism. “The study assessed expectant mothers, all of whom took blood tests to determine their vitamin D levels. The results showed that approximately one-third of the women were vitamin D deficient. When their children were about 16 months old and had their first dental exam, it was discovered that 22 percent of children had thinning enamel and 23 percent had cavities. Pro fluoridation pundits tell us that it is the lack of fluoride in our public water supplies that is leading to the high levels of dental caries being found in children and they continue to push this toxic poisonous substance onto people who do not wish to use it. Read the NaturalNews article to learn more. To learn more about this exciting development – click here. There will be many people who will arrive at this web page who have no idea about the harmful effects of fluoride. Some of them will feel angry that I am speaking out against this process. However, even though I am showing you the harmful effects of fluoridation I AM NOT SAYING “YOU SHOULD NOT USE FLUORIDE”! I would also ask you to do your own independent research into both the efficacy and safety of fluoridation. I, personally, believe that the information you are about to read on Fluoridation Page will probably be some of the most enlightening information that you will have ever read. There are many documents on this fluoridation page of extreme importance and it is hard to place them in a priority listing as so much new information that debunks the myths pertaining to fluoride safety and efficacy keep coming to hand. My only way around this is to place the latest news directly under this bookmark. If this is your first visit to this fluoridation page, then may I suggest you check the balance of the page out and in the future when you revisit all you will have to check is under the bookmark. Infertility in women was found to increase with water fluoridation. Food and Drug Administration (FDA) scientists reported a close correlation between decreasing total fertility rates in women between ages of 10 and 49, and increasing fluoride levels. Fluoride is not effective in reducing tooth decay. No correlation was found between the level of fluoride in water and dental caries. There appears to be a genetically related increase in tooth decay for Hispanics, Indians, Native Americans and Asians. Decay is related to the educational and economic level of the parents. May I suggest that you read the full article. Fluoridation Page is pleased to bring you information from Mike Adams dated 8 January 2011 where more information about the toxicity of our drinking water is being exposed. Fluoridation Page is pleased to bring information that Waterloo in Ontario, Canada ceased fluoridating their water supply in December 2010. Congratulations to the people of Waterloo and may their health slowly improve now that fluoride has been removed. Did you know that fluoride inhibits the workings of the thyroid? No wonder Americans and other fluoridated areas in the world have such a high incidence of thyroid disorders. Read the latest information. This is an extremely important document. It once again shows how the “authorities” skew the data in their possession to give their reader’s what they want them to believe. This is not the first time that fluoridation data has been misrepresented and no doubt it won’t be the last. One of the things that fluoridation of the public water supply does to infants is to make their teeth late in erupting. Therefore if you take the same age group of children from fluoridated and non fluoridated areas and read the statistics – then of course the result will look good as the kids from the fluoridated areas did not have their teeth at the time the statistics were taken! Please make sure you read Fluoride Fantasy and also the book review of how important water is. I have a copy of this book and recommend it as essential reading for everyone. When I write to Australian Health Authorities with regard to, what I believe, the harm that is being caused to my fellow Australians I keep getting told that there is no scientific evidence to back up my concerns. I also get told that these authorities have done research to ensure its safety. NOWHERE IN THE WORLD HAS SCIENTIFIC RESEARCH BEEN DONE TO VERIFY EITHER THE EFFICACY OR THE SAFETY OF FLUORIDE! One of the things that I have drawn attention to is the number of scientific studies that have been undertaken in China on the harm fluoride causes to the IQ of children. If you click on this link and scroll down the page to the heading Fluoride Information – Effect on the unborn Foetus you will find a number of the Chinese studies that have been on this website for the last two years. Fluoridation Page brings you a very balanced scientific study on this subject. Every variable that could have an impact on the research results has been taken into account. This is a very comprehensive report and I believe that the information contained in this should not be ignored by the Australian Health Authorities and for that matter – health authorities in all countries still doing fluoridation! If you live in Australia in an area that is fluoridated could I ask you to download this pdf and then write to your local State Member of Parliament. You may even care to send this report on to the Minister for Health, the Hon Nicola Roxon. Perhaps if enough of us send this report through to these people then they will have no alternative but to address the issue. If they don’t then I believe they have failed the Australian people under their particular Codes of Conduct in their duty of care of their citizens. What will amaze you with this document are the dates that these discontinuations occurred. Way back to the early 190’s! So if these countries/cities/towns had sufficient information 50 years ago on the harm that fluoridation causes - THEN WHY DON’T THE COUNTRIES WHO HAVE CONTINUED THIS PRACTICE – KNOW! Consequences of eating Turkey at Thanksgiving! What I can hear you say! Here is a young lass telling her tale about what happened to her with regards to cystic acne. When you click into the link below and read what this lass has to say – she will explain to you that Fluorderma isn’t a condition that you hear about every day. When you click into this link make sure that you click the Fluorderma link as well and see her pictures and read her story. How many people are in her position and just don’t realize the source of their complaint? Do you know where your fluoride comes from? 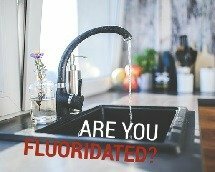 An article from Mike Adams, the Health Ranger, on fluoride that is being used in the US and sourced from China. I do not know where Australia sources its fluoride from. On investigation high levels of both lead and arsenic were found. This YouTube has many doctors speaking out in the first few minutes on thimoserol contained in vaccinations and the harm it is doing. Then the second part covers the reason behind fluoride. Information on a study in the Journal of the American Dental Association advising that fluoride is actually bad for your teeth. Surprise, surprise! How come ordinary lay people were able to come to this conclusion years ago and it is only now that the American Dental Association is finding out the related risks? All of a sudden dental fluorosis is becoming a buzz word and the majority of people are waking up to the fact that this is not just a cosmetic problem. Please read the article to see what is being said. More news on the fluoride front. "If this stuff (hydrofluorosilicic acid) gets out into the air, it's a pollutant; if it gets into the river, it's a pollutant; if it gets into the lake, it's a pollutant; but if it goes right straight into your drinking water system, it's not a pollutant. That's amazing." 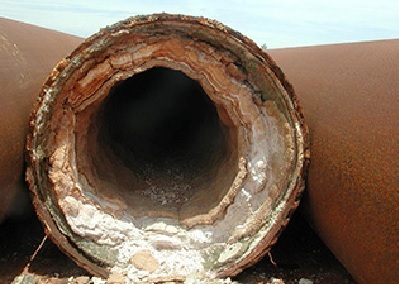 It is said the hydrofluorosilicic acid can have a reaction in the water which is known to leach more lead from lead pipes, lead-based solders, and lead-based brass fittings. It is also know to assist the body in absorbing more lead into our bodies! We are receiving reports in the past few months (date today 5 November 2010) of the alarmingly high levels of lead being found in our blood and particularly in children’s blood. This high level of lead is being blamed for behavioural problems and ADHD. 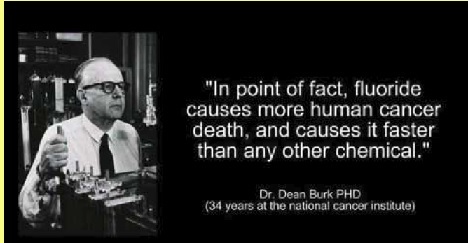 It is reported that when the body mass is small that the developing brain, small liver and kidneys are the organs most affected by the silicofluoride, fluoride ion, lead, arsenic, mercury and radioactive material. 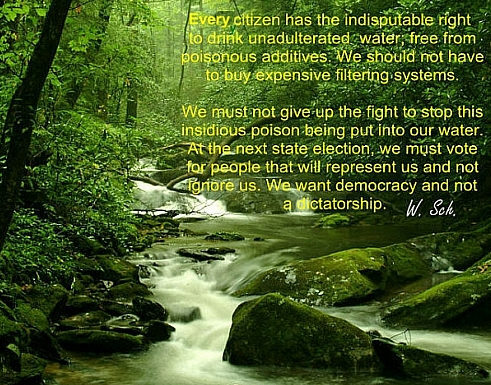 So why are we putting this substance into our public water supplies? The Eurobodalla Shire Council in Batemans Bay, NSW Australia has elected to put sodium silicofluoride into the public water supply no later than December 2010. I attended their Focus Group Meeting as a participant in February 2008 and raised the question of what form of fluoride would the council be using. First they were not in a position to tell the Focus Group which fluoride compound they would be using and so how could the participants or the community make an informed decision about whether they wanted it in their public water supply! Secondly, their reason for not knowing at this point in time was purely that they had to replace their water filtration system. When they had more information on the system that they were going to use then they were planning to use the fluoride compound which was the easiest to use with the filter system and the most economic! So the safety of its residents was the least concern! Cost and ease would be the deciding factor? WHERE IS THE EUROBODALLA’S DUTY OF CARE FOR ITS RESIDENTS? Eurobodalla Shire Council commenced putting artificial fluoride into the public water supply on Monday 14 November 2011. I hope you have found this page to be enlightening. Please remember to come back and see new updates underneath the bookmark at the top of the page and check out any new pages that may have been released.